Note: It’s about time I started using this blog – with that 1975 St Magdalene bottling almost gone (a bottle following the rule of never drink without the two owners present, which was broken only once, and for a good reason). So, I’ve been fantasizing about another Scotch Trip for some time, and now it actually seems as if it might happen, and big time. The idea is to visit all of the distilleries on the Scottish West Coast. This of course includes all of the hebridean distilleries (Peat anyone? ), as well as Ben Nevis and Oban – All in all, 16 distilleries. Details are still vague, but I’m already excited. Due to the geographical difficulty of gathering all the gang for a drink , we hadn’t had a tasting session for quite a while , so on the evening of the 18th we manged to gather all the friends in one place and have a nice evening with many drams shared. There was the Lovely Highland Park 21 Yrs ,The Nikka 12 yrs , Hakushu 10 years and the St. Magdalena 30 yrs (which deserves and will have its own entry). color – light hey gold , with no legs and a smooth swirl in the glass . Nose – Full nose, and powerful aroma – after you lt it sit out and breath for a while , in the first 40 seconds it was as if it had no scent , but once you wait it really blossoms . The peppers are the most dominant smell with a hint of caramel . Palate – The mouth is filled with an earthy flavor, full, and powering , once you let it settle other flavors come out : pepper , spices, caramel , all mixed together and not over shadowing another . when going down it leaves a nice slow burn and a hearty glow in the gut. summery a very pleasant dram for a light evening – grade 3.5 (out of 5) . color – The dram color was promising , light gold – like the Autumn leaves of a maple tree, nice swirl with short legs and smooth lines. Nose – If the Hakushu had a slow release on it’s aroma – the Nikka was a dead mover , it felt as though we needed to coax the scent out of it , eventually we got a whiff of sap, pines and plums. Palate – Since the nose was a let down , we hoped the palate will compensate , sadly we were mistaken, the dram was bland with no overbite and no burn , slight flavor of peppers and a feint trace of toffee , but once it goes down there is no after taste . summery – we kept the bottle as a cooking whiskey , not to all our liking , grade 2 (out of 5) . I first learned about campfire from a posting in Whisky Isreal blog , and thought I might give it a try . The event was held in a nice location although if you are not local – finding was a bit of a quest ( hidden in a office complex behind a pub ) As i am reading the “Hitchhiker Guide to the Galaxy” now – i thought that the only thing missing was the “beware the Leopard” sign to make it complete. Jamie’s story was a very light and flowing , and keeping and interesting pace while finding the common thread of Glenfiddich in his life , and during the story we were presented with a dram of the 15 Yrs Glenfiddich . Again an age old dram that the is worldly known , so i will skip describing it too ! 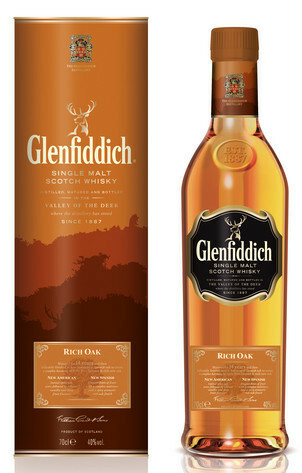 Glenfiddich 14 years Rich Oak , Personally i thought the first image of the bottle (presented as a wood carving) was much more appealing then the actual bottle , but I guess it was not a good way to sell . We’ll start of with the color : The Dram has a light gold ( almost honey hue) with faint traces of almonds , and in some lightings it has the hue of a light rust on a thin sheet of metal – all in all a good color and very promising . The swirl in the glass is very smooth and leave nice light silky legs on the rim . Nose : The first scent is a very sharp and hiding many of the properties , once you let your nose settle into it the currents of Vanilla , Peppers , Caramel and a Dry leaves emerge to give a nice lingering sensation in the nose. Taste : The dram rolls very smoothly in the mouth and leaves some unfamiliar feeling in this “young” Glenfiddich dram , it’s presence on the palette is very light and easy , no burn on the back of the mouth and no after burn going down in the stomach . Once it clears the mouth there are traces of Caramel, Almonds , Cream and an oily feeling that leaves you wondering what it is hiding. Color : To my surprise the water had no effect on the color , but it did make the swirl become even smoother . Nose : Again not much change , but an emerging scent that creeps out of the altered dram is of soft Klin dust with a pine over tone. Taste : The water gives this Dram the little push it needed for the nice burn it was lacking before , and that kick is dominated with a flavor of peppers coming out in force ( relatively) to compliment the others . All in all a very nice dram from Glenfiddich , and one I am happy to have experienced as it differs from the regular path of the Glenfiddich ( to me ) . What can be better ? The Scotch Malt whiskey Society is hosting a World cup final viewing , and even non members can sign up . The up coming whiskey exhibition had me contemplating on selfish thoughts , should I go on my own or suffer the same destiny as my drinking mates and maybe wait for the next one – that is due in September 2010 in Glasgow with the hopes that some of them might be able to join me ? The main issue is that if we do manage to gather all the Drunks in one place it will be a small clan going to this event with 2 offsprings to off set the amount we can sample . I have a month and some change to make up my mind .